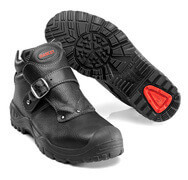 MASCOT® FOOTWEAR INDUSTRY is a footwear collection that is ideal for industrial work thanks to the footwear’s excellent sturdiness and durability. 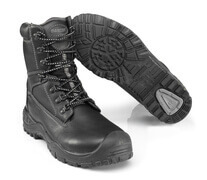 The footwear is also well-suited for craftsmanship, construction and logistics. The collection is designed for work on cement surfaces, in sewer pipes and in other places that are tough on your footwear. 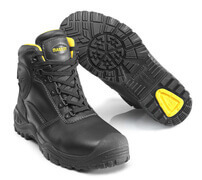 The footwear has a very durable scuff cap (toe reinforcement) above the toes, which make them very well suited for work in a kneeling position. Hard surfaces can be very tough on shoes that do not have reinforcement, so the scuff caps considerably extend the lifetime of the footwear. In order to make footwear in the MASCOT® FOOTWEAR INDUSTRY collection even more sturdy, they are fitted with a combined PU/rubber sole that can resist heat up to 300 degrees. This means you won't be at risk of damaging your footwear when working on very hot surfaces. All shoes and boots in the MASCOT® FOOTWEAR INDUSTRY collection are certified in accordance with the safety standard EN ISO 20345:2011 and approved for safety class S3, which means you are guaranteed optimal safety and a water-repellent surface. 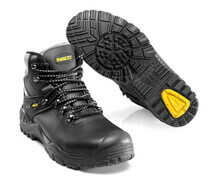 MASCOT® FOOTWEAR INDUSTRY is therefore well-suited for outdoor work and work in wet or damp environments. 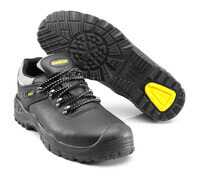 In accordance with the safety standard, footwear in this collection is equipped with midsoles and an ergonomically formed aluminium toe cap that protects your toes in case a heavy object falls on top of them. If you often work on ladders, footwear from the MASCOT® FOOTWEAR INDUSTRY collection is a good choice due to their ladder grip, which gives your feet stability and prevents you from slipping. You are also sure to retain a good grip on floors and other surfaces as the soles are particularly slip resistant and have a pattern which is designed to ensure that soil and dirt easily come away when you bend your foot. 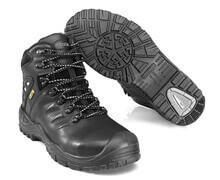 The sole is also oil and petrol resistant and resistant to certain chemicals. Footwear from the MASCOT® FOOTWEAR INDUSTRY collection are very comfortable, as they are equipped with a shock-absorbing midsole and a stabilising multi-function shank with a shock-absorbing core. This reduces the risk of tired feet and is also gentle on your joints – perfect for anyone who walks or stands a lot when at work. If you work on uneven surfaces, the multi-function shank will stabilise your foot, allowing you to avoid twisting and helping you to reduce the risk of injury.